We will be hosting a forum on San Joaquin housing needs next Tuesday at 9 A.M. Free and open to the public. Great line-up of speakers from industry and government. Learn about the latest statewide foreclosure forecast, the cost of new building development, and issues for future planning. My talk will be based on this report we released last December. The state's unemployment rate has now cracked the 10% barrier. The downwardly revised data now shows about 500,000 jobs lost in the state since the beginning of the recession. I'll admit that this a close match to our original forecast for the bottom we predicted in the 3rd quarter of 2009. I wish I could say that means the state has bottomed 6-9 months earlier than we thought, but the reality is that the bottom will be lower and the timing won't change much. Most other sectors are dismal too. Interestingly, retail shows no change in the seasonally adjusted numbers. That's because retail layed off the usual number of people in January. The problem is they very little temp. help for the holidays, so these layoffs represent permanent jobs and not the usual holiday help. Men's Basketball: Pacific 72, UC-Davis 57. Pacific hasn't lost to UC-Davis since 1940. Congratulations, Tigers! The 4th quarter OFHEO Home Price Index was released today. This is the only repeat-sales price index available for Valley metro areas, and is a better indicator than median or average prices typically reported in the local media. It's no surprise that 5 inland California metros (Merced, Stockton, Modesto, Vallejo, Riverside) show the biggest price declines in the U.S. over the past year. However, there is some good news in the pace of declines is slowing down. Stockton prices declined 5% from the 3rd to 4th quarter; that is huge but slower than we saw in earlier quarters (avg quarterly declines were close to 10%; from higher starting points). Sacramento prices are down 2.8% from the 3rd to 4th quarter; big but also about 1/2 the price decline seen earlier in 2008. Florida metro areas are dropping more quickly now than California, and will be at the top of these annual decline lists by summer. Time to comment on the state budget. In previous posts, I endorsed raising the gas tax, broadening the sales tax, alcohol taxes and the oil severance tax; and said the first place to cut spending long-term is the out-of-control costs of prisons. Finally, there is an awful lot of borrowing in the plan that isn't getting too much discussion. I anticipate some challenges will arise with this borrowing (and parts of the taxing/spending components), and the legislature will be wrestling with additional cuts and/or tax increases within 6 months. The upside of the legislature not taking any of my preferred actions is that I won't have to come up with any new recommendations. It's not just academics like me. Take a look at what Wilbur Ross has to say about the housing plan. 4. When the house is sold, if the value of the home has gone up at the point of sale, the homeowner and the lender share in the profits earned on the gain." The last two posts might give the impression that I don't support mortgage modifications. I actually do support aggressive modifications. I just think the plans being offerred so far delay rather than prevent foreclosures, and are less fair and effective than plans that involve reducing principal. My biggest problem with the Obama plan is that its modifications are based on a % of the borrowers income rather than the value of the underlying asset. Income should only be used to determine if you qualify for a refinanced loan - not the terms of the loan. Not only does the income basis make it into a welfare-type program, income is volatile so long-term subsidies could be based on short-term swings in income. I could get a long-term subsidy because of temporary job-loss, decrease in commissions, family leave, education leave - or not get a long-term mortgage subsidy due to a short-term increase in income. If the refinancing focus was on principal reduction with a shared-appreciation mortgage (meaning that in the event of a future sale that results in a capital gain, the homeowner shares the gain with the lender/taxpayers who facillitated the original principal reduction), the amount of sharing could be a function of the original downpayment. For example, you could make the share of future appreciation the homeowner keeps 2.5x their original downpayment (up until the point the forgiven principal is fully repaid). Thus, 100% financing speculators are ineligible, 10% downpayment would keep 25% of future appreciation, 20% down would keep 50% of future appreciation, etc. Obama's foreclosure prevention plan prominently says it provides "no aid for speculators." However, it defines speculators simply as people who do not live in the home. Everyone who buys a home is a speculator on some level, even if they live in it. I think the intent is to protect homeowners, perhaps we should define homeownership as the degree to which people speculated with their own money versus borrowed money. If you bought a home with 100% financing you weren't a homeowner at the time of purchase even if you lived in the property. Unfortunately, the current plan provides more relief to the 100% financing speculator than a homebuyer who made a similar purchase with a down payment. Before, I criticize it, I will say that the plan announced today is better than anything we have seen up to this point. It is the first plan that does not require a borrower to be 60 days behind in their payments to get relief. That's a big step in the right direction. However, I have concerns about the effectiveness and fairness of the most important part of the plan. This part provides incentives to rework mortgages so that they are no more than 31% of the borrowers incomes. Consider three homeowners. Each bought a house in the Valley in 2006 for $400,000 and the value has decreased to $200,000. 1. Income of $50,000 per year, and got 100% financing and a sub-prime, no-doc, adjustable rate mortgage. This person is almost certain to default if not already. 2. Income of $75,000 per year and put 10% down, and has a $360,000 mortgage. Their initial $40,000 down payment is gone, and they are deep underwater. They can’t refinance, are deep underwater and have moderate default risk depending on their loan. 3. Income of $100,000 per year and put 20% down, traditional mortgage. Their initial $80,000 down payment is gone for good, they are deep underwater on their mortgage ($120,000), but can afford their monthly payment. These are responsible buyers who could have bought a lot more house in the 2006 lending environment, but stuck to a traditional, conservative loan. How is each family treated by the Obama foreclosure plan. Family #2. Their mortgage is adjusted down to a monthly payment of 31% of their income which is $1937.50 per month. They get a lightly subsidized taxpayer interest rate of around 5% (assuming they are in a 30 year fixed). They pay $7800 more per year than family #1, and over $1,000 per month more in interest. They are still deeply underwater with little chance of coming out, and have already lost their $40,000 down payment. Family #3. Their current monthly payment is less than 31% of their income, because they could afford it in the first place. They can’t refinance to a lower interest rate (even under the new plan), because they are still deeply underwater despite putting 20% down. Their $80,000 down payment is gone. They have lost the most, but get no help, because they are considered the least likely to default. The benefit of this policy is a short-run decrease in foreclosures. However, in the long-run all three families are in a serious negative equity situation that is unlikely to change for a decade or more. Thus, they will eventually default or short-sale if they move. Family #3 hasn’t even seen a reduction in monthly payments and can probably rent a comparable house for less than their mortgage. Family #3 has a strong incentive to “walk away”, and this policy is betting a lot on the hope that their past responsiblity demonstrates that they won't. Not much has been done to mitigate the long-run risk of foreclosure for any case, as the payments for #1 and #2 will start increasing again after 5 years and they will all still have negative equity. Assuming this policy postpones defaults for a few years, taxpayers are on the hook for about $11,000 in incentives for the first 2 cases of reworked mortgages, and over $4,000 per year in interest subsidies for cases 1 and 2. Over 5 years (assuming no defaults), the cost to taxpayers is around $44,000 to help the first 2 cases stay in their homes longer. Eventually, we will still bear a significant cost from foreclosure too. By basing the monthly payment on income rather than the value of the home, the program is a lot like welfare with a similar trap. People are “taxed” in terms of giving up their subsidy for earning more income. Family #3 or #2 could choose to earn less (quit a part-time job, perhaps have a 2nd earner stay home), and have a large amount of the lost income replaced by a big mortgage subsidy. We are still awaiting some details on the Obama plan, so it could turn out to be somewhat better than I describe. However, I still believe “shared appreciation mortgages” are the best approach. These are discussed in some previous posts. Update 2/17: The Sacramento Bee has posted an on-line tax increase estimator. Check it out. Looks like my rough calculations were fairly accurate for my family. The structure of this tax increase is pointed towards middle and lower income taxpayers compared to the current system (which is very progressive). The income tax increase is relatively small and dominated by shrinking the child tax credit. Perhaps California's tax system is too progressive now and it should shift in this way, but that is a political/equity debate for another time. It is true that this tax increase will be more of an anti-stimulus, because the tax increase is pointed more at the lower/middle income people who are more likely to adjust their short-run spending in response. Some rough, preliminary estimates of how the legislation pending in Washington and Sacramento will impact my family's tax bill if approved. My wife and I are fortunate to both have good jobs, health benefits, etc. Our income is in the mid-$100s and we have 2 dependent children. The Federal stimulus package will provide $800 to married couples, but this will start phasing out at $150,000 income. I haven't done our 2008 taxes yet, but I think we will be in the partial phase out range, so we will probably get around $500 from Obama's tax cut. 1. about $600 more in income taxes ($420 from the $210 reduction in the dependent tax credit and around $180 from the 2.5% surcharge). 3. about $300 more in gas taxes and vehicle license fees. I have no doubt there are some errors above, but I think it is a reasonable estimate for us and people in a similar position. On net, we will probably be paying another $1000 in taxes per year. One of the more interesting aspects is that for the majority of taxpayers with dependent children, the loss of the tax credit is going to have a much bigger impact than the income tax surcharge. The House and Senate conference seem to be dumping some of the least effective provisions (e.g. homebuyer tax credit) in the stimulus package. That's good. However, the final package is really only about $700 billion (you really can't count the $70 billion AMT patch as new stimulus since this has been done every year in the recent past and isn't really a change to current policy). It is a little skimpy compared to what most economists are recommending, so don't expect miracles, but it will help. It should be passed and signed ASAP. Time to move on to the harder problems; bank bailouts and housing. Aguanomics has an interesting post on desalination today. The guys at DXV claim they can produce desalted water at a little more than $600 per acre foot, about half the cost estimates of current technology. They may be overly optimistic, but this future cost estimate for desalination is less crazy than the PPIC assuming >$2000 acre foot for desalination (in 2050 in current dollars) in their pro-peripheral canal report. It's a good time to link to the $10,000 bet I offerred to the PPIC/UC-Davis authors months ago. If PPIC/UC-Davis decides to stand behind their assumpitions and accept the wager, I pledge my winnings to DXV or whomever breaks the $1000 barrier. Desalination isn't the silver bullet for California's water problems. However, as the backstop long-run technology for urban areas, it is highly relevant to decisions of whether to spend billions on a peripheral canal and more dams. Should California tax home buyers for 1 year? The biggest change in the stimulus brought about by the Senate compromise bill is the removal of $40 billion in "fiscal stabilization" aid to state and local governments, and the addition of a $15,000 homebuyer tax credit that will likely cost around $40 billion. This "swap" will have a big impact on California. California's share of the "fiscal stabilization" cut will be about $5 billion. The result will probably be deeper cuts in education funding or a state tax increase such as the temporary sales tax increase or an income tax surcharge. A significant share of the homebuyer tax credit will also flow to California. However, I don't believe this will do much to stabilize the housing market. It will mostly be a windfall to homebuyers with solid finances (it can't help with a downpayment since the cash comes in a tax refund next year). It won't stall foreclosures, and as a temporary measure, will not have any impact on long-term home prices. Hasn't the real estate boom and bust in this state already done enough to enrich some while impoverishing others? I recommend the state take the federal tax credit back with a surcharge on the state income tax of anyone who gets the federal homebuyer credit. I don't know the logistics and legalities of doing this, but there must be a way. It won't eliminate the need for tough choices in the state budget, but is far better than some of the alternatives being considered now like increasing the sales tax. Update 2/13: It appears that this homebuyer tax credit has been removed from the final stimulus package, so this proposal is no longer relevant. Alan Blinder is making a lot of sense in the Wall Street Journal today. His first 3 points in the section on foreclosure mitigation are worth emphasizing. Second, the refinancing plan should not make missing several mortgage payments a prerequisite for assistance. We don't want to encourage more delinquencies. Third, I have reluctantly concluded that Congress will have to realign some property rights to free mortgages from the legal straitjackets created by complex securitizations. Also worth reading: Yves Smith rants about the plans for a new and improved TARP. I share many of his concerns. My feeling is that the Treasury is trying to be too clever here. I support a stimulus package, but the news reports of Senate negotiations make me nervous. Dianne Feinstein is trying to slip in an extra $7 billion in unnamed water projects. (That might be good if it's repairing ancient, leaking sewer systems, but this makes me nervous given the current issues in state water policy). Barbara Mikulski is pushing tax deductible car loan interest!?!? On the other side of the aisle, we have "free market" Senate Republicans like Mitch McConnell pushing for price controls (in the form of legislated fixed mortgage rates), and John McCain saying Americans don't support the stimulus package because it's become a spending bill (of course it's a spending bill! that's what Americans have been asking for and the economy needs. Build roads, bridges, energy infrastructure, etc.). All of these breaks (whether it is car tax breaks or artificially low mortgage rates) are going to be politically difficult to take away once they exist. One time spending items are what we need (preferably investing in badly needed deferred maintenance, infrastructure and energy with long-run payoffs). Couple this with some one-time transfers to state and local government, and some one-time tax rebates to help families. The key words here are one-time, short-term, and keeping it as simple as possible. When we are talking about permanent long-run changes to tax policy, health care, etc. then by all means let's be bi-partisan, filibuster and debate for months. As disturbing as these Senate antics are, it is not nearly as disapointing as the rumors that the administration is going to bring back the original TARP idea of the governement buying bank's bad assets. I thought that disapeared with Paulson. I'm still holding out hope that this new TARP plan is better than I fear, but the stimulus circus isn't giving me much confidence in Washington rght now. I haven't commented on the state budget in 2.5 months. The reason is that basically nothing has changed, despite all the drama. My view hasn't changed much since this post 2.5 months ago, but my view of the players (legislature, Governor, unions) has decreased. In short, I'm willing to support a lot of the smaller tax increase proposals that have some long-term policy merit. These include broadening the sales tax base (even beyond the short list of services and amusements proposed by the the Governor), increasing alcohol taxes, imposing an oil severance tax, and modest increases to vehicle license fees and gasoline taxes. I oppose the temporary or permanent increases in the sales tax rate or income taxes. These are the larger revenue generators that individually would probably do more than the list I have endorsed above. Thus, there needs to be some significant spending cuts too. The costs of the prison system are out of control, and I am not an expert on how to do this but something drastic is in order. K-12 education should be protected as much as possible, but I think some deeper cuts to community colleges offset by increased tuition is reasonable. Overall state payroll costs must come down somehow. I support the 2 day per month furlough for now (the unions have not won my sympathy with their actions), although I would prefer more targeted cuts to specific programs. The furloughs should end earlier than planned (or at least be be reduced) if some real cost-saving alternatives are implemented. Of course, this isn't the whole solution (and the exact amount of help in the federal stimulus is uncertain as well.) It sounds as if all sides are digging in their heels, an outcome which is bad for the state and will only make the eventual adjustment more painful. In a previous post, I displayed this graph and wondered whether the Red line (California) above the Blue line (U.S.) was a new trend. Below is the updated graph after California's miserable employment report for December. 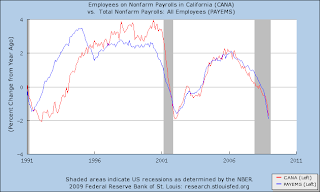 It looks pretty clearly like a synchronized collapse of employment, and not the beginning of a trend where the U.S. is declining more rapidly than California.